Did you know that although Latinos are less likely to develop cancer than other ethnic groups, they have a much higher rate of being diagnosed late? This doesn't have to be so. The American Cancer Society's apple-green wrist band symbolizes the tremendous strength of the Latino community and the hope that, together, we can erase the disproportionate burden of cancer they face. The American Cancer Society works every day to reach these under-served communities with health awareness messages and services. 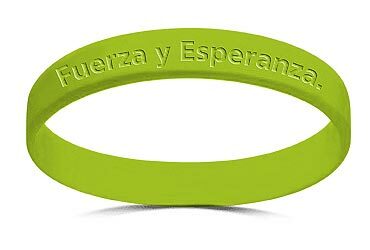 Help us spread the word about the importance of prevention and early detection by wearing the "Fuerza y Esperanza" wrist band proudly. Share the wrist bands with others to ensure that the Hispanic community leads long and healthy lives. For more information about cancer and the Latino community, as well as to view the American Cancer Society's prevention and early detection guidelines, please visit www.cancer.org. In stock and shipping. Please allow 7 days for delivery.